Resale Levy is applicable to those ECs where the land sales is launched on or after 9 Dec 2013. 1. Sold on or before 1997. Resale levy is computed 20% of the new EC’s purchased price. (Eg. EC $1mil, resale levy $200k). 2. Sold their subsidized flat on or before 3 March 2006. Resale levy computed by percentage. If the graded resale levy was not paid when you sold the first subsidised flat, i.e. you opted to defer the payment until you purchase/ take over another HDB flat, interest at a prevailing rate of 5% per annum is charged. 3. Sold their subsidized after 3 March 2006. 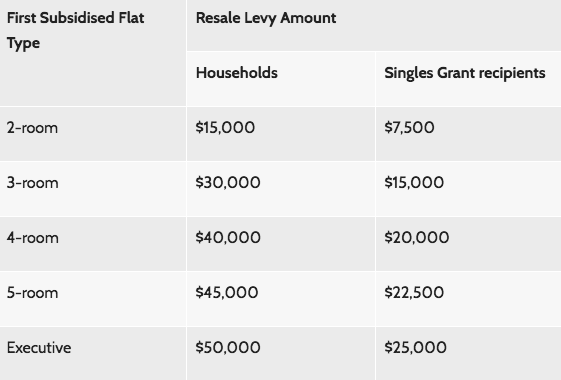 Resale levy is computed by flat size. 🔴 If buyer OWNED a subsidized flat before, SOLD it, bought a Resale Flat and still staying in it. They need to pay their levy before S&P can be issued. 🔴 If buyer is now staying in a subsidized flat now, n book an EC, they need to pay after they sell the current flat. It will be deducted from sales proceeds.